…to Triassic reptilian oddities like the absurdly long-nacked Tanystropheus (here in yet another extremely modified version from the Holtz/Rey encyclopaedia… couldn’t resist foreshortening that tiny head) . In the background: a primitive Triassic ichthyosaur and Keichosaurus . 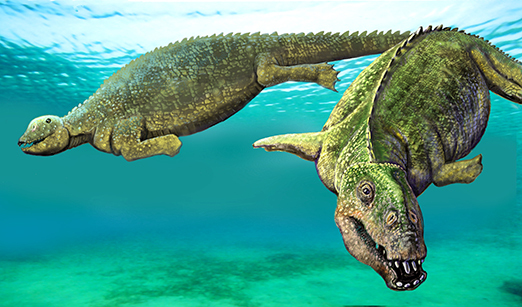 The second illustration is the sea cow-like reptile Placodus. 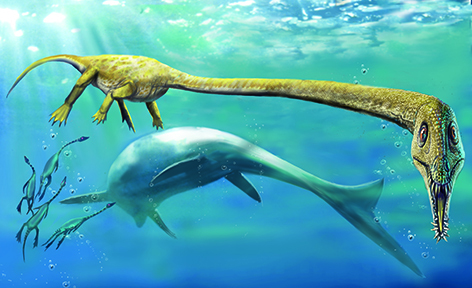 It is interesting to note how evolution repeats patterns in such different animals like these reptiles and their mammal equivalents today: Placodus=dugong, ichtyosaurs=dolphins… their similar body plans resulting from what were originally terrestrial animals adapted to aquatic environments. 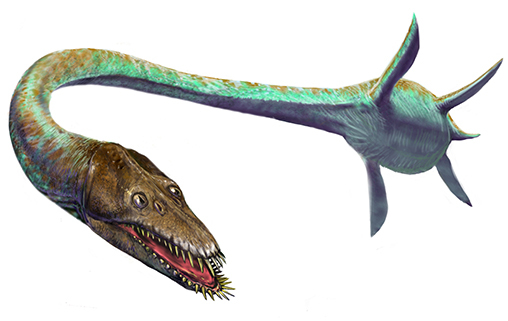 The reconstruction of Placodus is based on museum mounts. 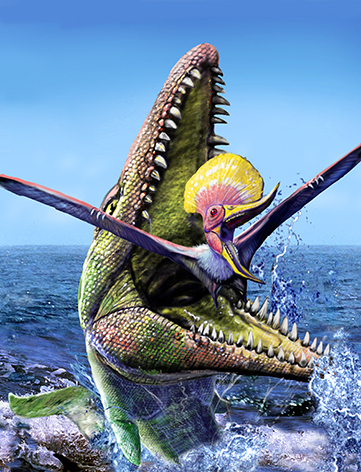 And second one, a mosasaur about to swallow a dsungaripterid whole! 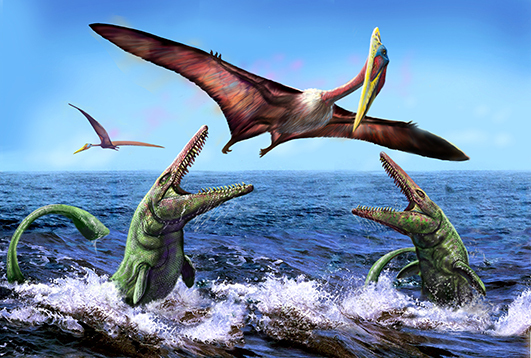 This entry was posted in extinct fishes, marine repstiles, Pterosaurs and tagged Archelon, Cladoselachus, Dsungaripterus, Dunklosteus, Elasmosaaurus, ichthyosaur, Keichosaurus, mosasaurs, Quetzalcoatlus, Tanystropheus, Tylosaurus. Bookmark the permalink. 9 Responses to In The Sea… a collection of revamped oldies. Great stuff! 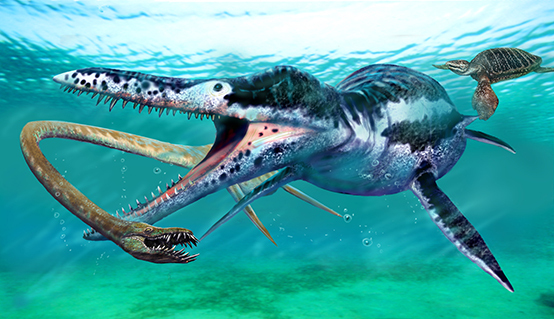 One question, though: isn’t that a dsungaripterid (and probably Dsungaripterus) in the bottom image with the mosasaur? 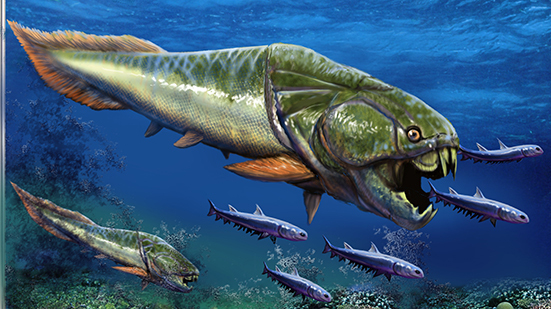 It seems a better fit than Tupuxuara, with its upturned jaw tips, posteriorly-placed teeth and prominent anterior crest margin. You are the expert Mark. I think we could discuss it with Dave Hone, but I had my doubts for a long time and most probably you are right! Thanks. Just aught up with this. Yeah the presence of teeth and jaw tips are very Dsungaripterus like and not very Tupux. like. As always I enjoy seeing your new artwork, they are aboustly magnificant. I’m also very glad to see that you have done more with ancient marine life. I love the pliosaur attacking the elasmosaur, is it based on the elasmosaurid skull that Tulburn and Turner desribed as being bitten and crushed by Kronosaurus? As far as prehistoric animals go, plesiosaurs are hands down my favorite, and it is great to see you making more of them. Like you mentioned, although they are not as famous as the dinosaurs they are equally impressive. So much is going on nowadays with new research on ancient marine reptiles, for instance the diets of elasmosaurids have been shown to be vaired(shellfish stomach contents). It also now seems that some mosasaurs may have had a tail similar to a shark(Caldwell, Lindgren, Everhart 2010). Keep up the very excellent work! Interesting… I love well research controversy… and why not? These revamps are wonderful, Luis! I really love the perspective you give your animals ….. you always seem to be able to capture so much dynamism and action in your art. Fantastic!